Synopsis: “Autistic, Schizophrenic, Psychotic…”, these are the words used to describe Babloo aka Balwant Srivastav apart from Vandana, his love. She treats him the way he wants the world to see him. A random twist of fate on Mumbai’s endless, serpent-like, jangling local train tracks ties the central characters Babloo, Vandana and ‘The Rail Man’ together in a complex weave of love, heartbreak and courage. Babloo draws the reader into his fascinating, heart-rending journey through the twisted, choked lanes of Mumbai especially Bandra, into an open space where he can finally exhale, be born again. Review: This novel is a first person narrative by Babloo who lives along with his parents and younger brother in a railway quarter, next to the tracks of the Bandra Station. Though he lives with his family, he is always aloof from them. Suffering from autism he finds it difficult to cope with things and thus is detached from his family. Everyone considers him useless and burden. But the fighter he is, he is determined to prove himself but not sure how. With limited to none at all interaction with others, he passes his time by watching C grade films in a nearby theater and looking forward for an interaction with Vandana with whom he sees his future. Babloo takes us through his fascinating journey from days where his only aim being a small interaction with his dream girl to discovering an ambition and determination in his life to do something productive for himself and the society by large only to woo the only Love of his life, Vandana. The first person narrative style used by author is crisp, clear and easy to the eyes. The author has a clear grip on the story with a steady pace without letting any dull moment whatsoever. There were many moments where I desperately wished it should not go this way with lots of oh no’s and oh yes. The quote : “She has big expressive eyes which changed size innumerable times during each episode of her favourite soap opera.” took the cake. The character of Babloo is superbly etched and well researched. His moments of Q&A with himself, inability to understand difficult, speedily spoken words and the ways in which he makes his life simple yet enjoyable makes him an endearing character. All the characters, situations, twists and turns are well placed. The author’s love for the city of Mumbai as well as Bollywood can be clearly seen with his description of various roads and places with ease, references to Amul hoardings along with striking similarities with a superstar. 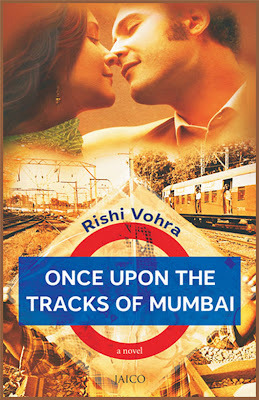 Overall: A different and a refreshing love story said with ease with similarities which one can easily relate to one-selves, be it the railway colony, the roads and trains, the characters and the emotions. A perfect recipe for an entertaining evening! Highly recommended!! Cheers! Keep Smiling! Spread Love! Embrace Life! I wish I found it here. Thanks for the recommendation Hetal. Here as in? You based out of India?